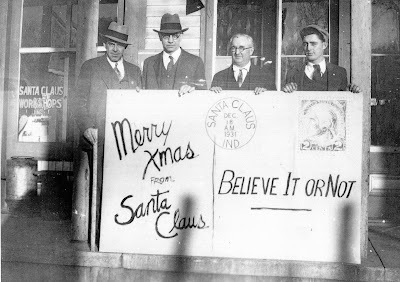 Today marks the 80th anniversary of a big day in Santa Claus town history. Big might be an understatement. It’s more like an oversized day in town history, specifically for the Santa Claus Post Office. 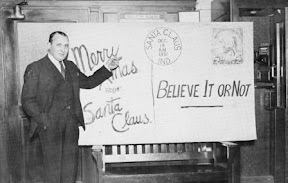 On this day in 1931, Santa Claus postmaster James Martin hand-canceled what was said to be the largest postcard mailed in the world. Emblazoned with just a 2-cent stamp, that postcard was mailed from New York on December 12 from none another than Robert Ripley of the famous Ripley’s Believe It or Not. Ripley’s syndicated newspaper panels were printed around the globe and at its peak in popularity back in the early 1930’s, more than 80-million newspaper readers saw the panels. 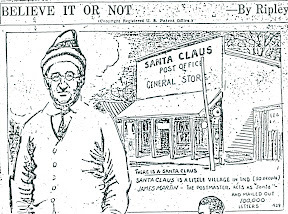 Ripley first learned about the Santa Claus, Indiana post office in 1930 when Congressman Harry Rowbottom of Indiana introduced a bill in the U.S. House of Representatives providing more pay for the postmaster of Santa Claus. Postmaster James Martin (he’s third from the left above his giant postmark) sent the giant postcard back to Ripley but not before posing with it outside the Martin General store, also the site of the town’s second post office. 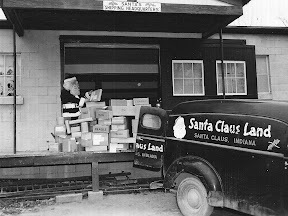 From that point forward, the Santa Claus Post Office would be known worldwide as Santa’s Post Office and was often crushed with enormous amounts of mail coming to the jolly ‘ol elf. It took an army of volunteers spearheaded by Santa Jim Yellig to help Martin dig out from all those letters, ensuring each and every one got a letter back. Nearly 100 years later, the tradition of townspeople and now Santa’s Elves helping answer thousands of letters to Santa from around the globe carries on today. Cheers to you Mr. Martin & Mr. Ripley! Santa Jim Yellig stands on the loading dock of the Santa Claus Post Office, checking each name twice on his outgoing parcels no doubt!